Thanksgiving holds a Rite of Passage for every person – moving from the kids table to the grown up table. That transition demonstrates that the larger family is ready to welcome you fully as one of their own; they believe you can add value to the larger table without causing too much of a mess (I don’t have the best table manners, so this was a concern for me). 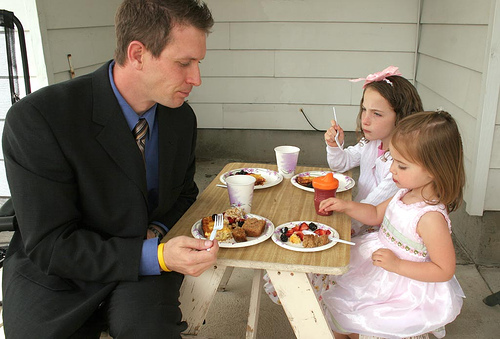 Churches have ‘kids tables’ and ‘grown up’ tables, just like family Thanksgivings. There are expectations – As you get older, you’re expected to contribute to Thanksgiving dinner, whether it’s bringing some food, helping clean, or hosting. Similarly, Christians are expected to contribute value to their church. These ‘kids tables’ can help that transition go smoother. Helps create space – As family members grow up, the kids can now begin to take the places of their parents. (Imagine how nice it would be to have your niece or nephew prepare the turkey instead of having to do it yourself!) Similarly, as younger Christians (both in age and experience) mature, they can begin to take over some of the church. There are times, however, when churches take this too far, and never really let people move from the kids table. This Rite of Passage can be difficult for any number of reasons. “Mom’s turkey is/was better” – That first meal where you don’t get the secret recipe is always tough. But eventually, someone else needs to cook the meal. Changing the order/style of worship (for example) can be tough because it’s undoing the emotional memories of the churchgoers. And this can be true for small changes (like announcements or the offertory) as large changes (worship time, music style). “You can do what you want. At YOUR table” – Did you ever make a recommendation to change the menu, but it didn’t go well? Like your family likes mashed potatoes more than sweet potatoes, but you always have twice as much sweet potatoes as mashed potatoes? So you suggest maybe someone switch from sweet to mashed. And you’re told politely that you “can do that at your Thanksgiving/table/etc, but not here”. The church can do this a lot. “You can play the music you like at the second worship service/youth service/etc.” “You can wear jeans at the contemporary service, but you need to have slacks and a tie on here”. Transitions are difficult for any organization or church, but they are necessary. Eventually, the kids are going to grow up and cook Thanksgiving dinner. Just because they don’t have it at dads house, or don’t use aunt Teresa’s recipe doesn’t mean it’s not Thanksgiving. The churches responsibility is to raise up the next generation of Christians, EVEN if they don’t do everything your way. So the kids want to order pizza instead of spend twenty hours cooking a turkey, big deal. It’s because they’d rather spend time together. So what if the kids want to sing different songs, Tweet during the service, or use an iPad as their Bible. And more importantly, do your ‘kids tables’ help them know Christ, or just your traditions?